Chicory root is a hardy perennial best known for its association with coffee - it produces a more roasted flavor without caffeine. Chicory root can be made as tea or added to a hot beverage for a coffee-like flavor. Roasting chicory provides a bittersweet taste that resembles coffee. 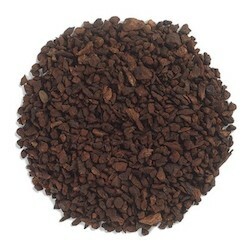 Coffee lovers will agree chicory root does not duplicate the taste of coffee. Some coffees offer blends with up to 30 percent chicory, which cuts down on the caffeine content of the blend.